The new BAMF 25′ is as tough as they get! This classy ride with a 360 degree view is the ultimate for both fishing and excursion trips. 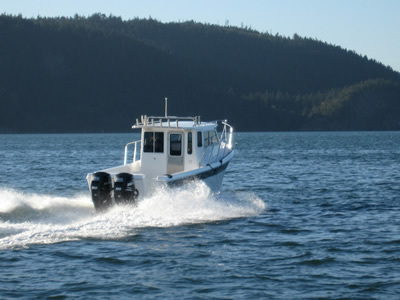 Our boats have a Kevlar reinforced hull and today’s most advanced resins and fiberglass materials. The hull is designed for stability and a smooth ride through choppy waters. Our full wrap around deck offers easy fishing from anywhere on the boat. Store your catch in the two large, insulated and water tight fish holds. The has a large V-berth for sleeping, a marine head, sink and lots of options to add to your overnight comfort while on the water. 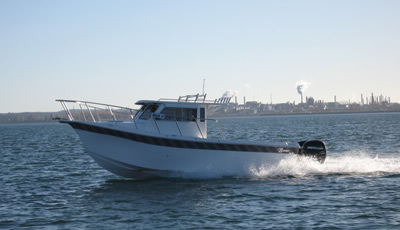 The BAMF 25’s arrangement incorporates safety, superior structure, extra headroom, and a thicker hull. Its upgraded design is sure to please sport fisherman, family weekenders, and safety-conscious charter operators. Powered by an impressive Volvo 260 HP D-4 Diesel the boat will cruise at 32 MPH using 8 GPH with top speeds of over 40 MPH. A standard 200 gallon fuel tank gives the BAMF 25′ the capability for long range trips.